For years, Enterprise Vault customers have struggled to empower end users with the same message search and restoration functionality currently leveraged by IT departments. With Archive Accelerator Enterprise Search, we’re making this a reality for customers today. Enterprise Search allows users to directly and securely search journal or SMTP archives – restricting access to only those messages they have sent or received. Users can view all messages – even those deleted or yet to be archived. While mailbox archiving isn’t a requirement for Enterprise Search, the pairing of these two solutions offers users a single location to search all e-mail content. "The search product has truly bridged the gap to provide EmailXtender-type functionality to our users. Coming from an EX shop and migrating to EV, many of our users were reliant on searching the journal archive. The search product does a fantastic job of providing that functionality to a subset of our users and has definitely enhanced the user experience." Here’s how it works: End users make use of a simple, intuitive HTML5 search interface based on Enterprise Vault’s existing index – permitting them to explore messages based on content, data, recipients, or any other popular parameter. Restoring an item can be accomplished with a single click – placing it in a sub-folder in the user’s “Restored Items” mailbox. The name of each sub-folder automatically coincides with the day/time of restore for easy search. We recently added the ability for Enterprise Search to take advantage of a new capability Archive Accelerator has to create a metadata database of all the information in Enterprise Vault. Using this database, we can accelerate many searches by a factor of 10, while also reducing the load on the Enterprise Vault environment. This makes finding and working with sought after emails and their data much easier than before. 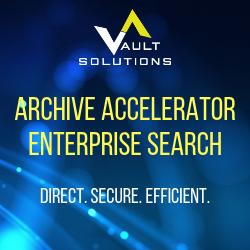 With Archive Accelerator Search, Vault Solutions puts the power of Enterprise Vault directly in the hands of each user.